ABBA has always been known for hit singles, but albums? Except to die-hard fans, the casual listener may hard pressed to think of a definitive ABBA album, unlike the Beach Boys’ Pet Sounds, the Beatles’ Sgt. Pepper or Pink Floyd’s Dark Side of the Moon. Super Trouper, the group’s 1981 album, could be a potential starting point for those who want to seek more ABBA go beyond the usual greatest hits record. It’s a pure pop record that has a couple of the quartet’s beloved tunes: the cheery title song, the heartbreaking and dramatic ballad “The Winner Takes it All,” and the disco-influenced “Lay All Your Love On Me.” Aside from those tracks, the rest of Super Trouper is not all filler: the electropop-like “On and On and On” has a New Wave feel to it; “Andante Andante” is a sentimental romantic ballad that befits the title (May not be suitable for metal heads, though). Other tracks such as “Me and I” shows ABBA’s rocking side; “Happy New Year” is an anthemic ballad as “Our Last Summer” is sentimental and touching. 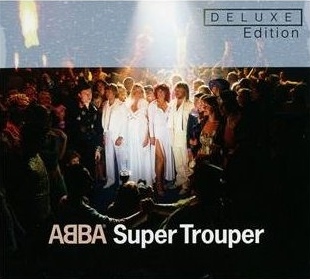 Full of hooks and sparkling production, Super Trouper is a good time capsule of ABBA still at its peak popularity. This 30th aniversary special edition contains several bonus tracks (i.e. “Put On Your White Sombrero”) that augments the original album; a DVD containing a documenatry on the album, a featurette behind the circus cover, and performances of “The Winner Takes it All” and “Super Trouper” on German TV’s Show Express.